It has never been properly explained to me why we still celebrate Columbus Day as a national holiday. What is it exactly are we supposed to be celebrating? The fact that some gold-crazed Italian convinced the Queen of Spain to subsidize a failed attempt to circumnavigate the globe? By now, I would have thought our jingoistic fervor would have subsided to the point that we could collectively acknowledge that Christopher Columbus didn’t discover a damn thing beyond the fact that he had no idea what an actual Indian person looked like. I mean, it takes a delusionally euro-centric worldview to convince yourself that you’ve discovered a place that people are already living on. There’s a reason why we refer to the indigenous peoples of the Americas as Native Americans, namely, because they were there before we were! And, even if you take the native peoples out of the equation, Columbus wasn’t the first European to find “The New World.” Leif Ericson and his band of Nordic brethren had already set foot in modern day Newfoundland, 500 years before Columbus reached the West Indies. Ultimately, Columbus was nothing more than a very meaningful accident. He set out to find a quicker spice route to India and the Western Hemisphere just happened to get in the way. Not that Columbus himself was aware of any of this. He would go to his deathbed thinking that the new sea routes he “discovered” had led him to the Indian subcontinent. Of course, as a kid in elementary school, you likely won’t learn any of this because it isn’t part of the great American narrative. Columbus can’t be a buffoon and he can’t be a tyrant because, if he is, then we are as well. How could we celebrate Columbus Day and then tell our children that Christopher Columbus’s first impulse upon reaching The New World was to, “[take] some of the natives by force,” in order to teach them who was superior and to extract information from them? What would our children think if we told them that Columbus’s response to the kindness and the generosity of the Arawak Indians was to write that, “they would make fine servants,” adding that, “with fifty men we could subjugate them all and make them do whatever we want”? Would we mention that only a quarter century after Columbus’s arrival on the island of Hispaniola, over 85% of the indigenous Taino people had died out, the victims of slavery, smallpox, starvation, suicide and slaughter? Do we tell them that Columbus’s arrival in the new world would herald the beginning of over 4 centuries of systematic targeting of North American Indians and their land that would see their numbers plummet from an estimated 12 million in 1500 to just over 237,000 at the turn of the century? Nah…better to stick with In fourteen hundred and ninety-two, Columbus sailed the ocean blue and call it a day. 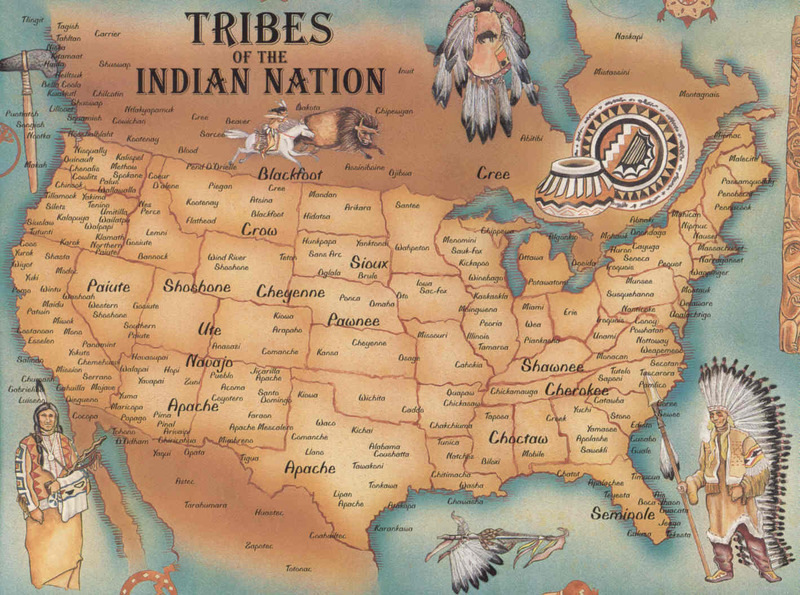 A map containing a small portion of the more than 560 federally recognized American Indian tribes. Good luck finding a US History textbook that so much as mentions most of them. If you look at your average high school US history textbook, the amount of space devoted to talking about American Indians is negligible. There’s usually an introductory chapter dealing with “Pre- Colombian” America that focuses on tribal history because white Europeans literally haven’t shown up yet, followed by the intermittent inclusion of native peoples when their actions had some sort of direct effect on white civilization. For instance, they’ll cover Pocahontas because she ended up marrying a Brit or they’ll give a callout box to the Wampanoag Indians because they were the ones who made sure the pilgrims at Plymouth Plantation didn’t starve due to agricultural incompetence during their first few years in Massachusetts. Very rarely is American Indian history presented on its own merits, unattached to the dominant Eurocentric model that has been taught for centuries. Instead, it is included in textbooks to frame the inevitable progress of White Americans as they gobbled up American Indian ancestral land like Kudzu enveloping an abandoned house. The approach to the history of American Indians may claim honor for it’s truthfulness and liberal outlook. This truthfulness and liberal outlook may pave the way for setting out towards a new world order, a new society ! “Truth is singular. Its ‘versions’ are mistruths.” to frame this article as a liberal outlook is an attempt discredit the inherent and singular truth of the article. Pardon my ignorance, but how much of Native American history do we even know about? How much of it has been recorded? How much of it lives on in verbal tradition? I always assumed that it wasn’t talked about much because most of that information had been lost. Pardon my ignorance, but how much Native American history is even available to us? I always assumed it was never discussed because it had mostly been lost (with the exception of whatever information we can glean from ruins).